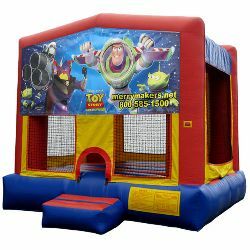 How much fun can you have when you rent the Toy Story bounce house? "To infinity and beyond," as Buzz Lightyear would say. Front graphic shows the villain Zurg, Buzz Lightyear and little green men.